Nice set of six vintage cordial glasses, rich cobalt blue glass with a patina chrome base. No chips or cracks. Most likely 1920s American. Set needs a good cleaning. New old stock in original box, rare set of five Pierre Cardin cocktail glasses. Made in Japan. Set of three Iittala Finland decanters in like new unused condition. Consisting of one wine decanter and two beverage vessels. Iconic design by Kaj Franck. Art Deco decanter set from the 1930s with six glasses. 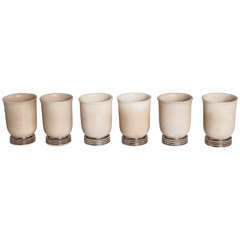 Set of six Holmegaard crystal stemmed cordial glasses. Visit the Paul Marra storefront to see more furnishings and lighting including 21st Century. Hand driven set of silver plated liqueur glasses, based on geometrical forms. They are Art Deco made in Germany, 1920s. Rare extra tall cobalt blue glass cocktail shaker (16 H) with two original glasses each 4.75 H x 2.75 diameter. Pure Art Deco style, stunning deep color, ready to use condition. 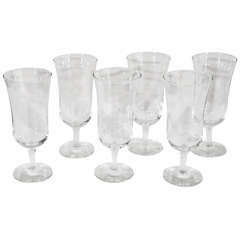 Set of six estate American sterling silver cordial glasses, circa 1930.